Here's a website that uses what you have in your pantry and sends you recipes. It's a cool idea. But it has flaws. For example: I have lemons. And I have rice (among other items, but work with me here). It offered up a recipe for lemon rice, that sounded very tasty and actually like something my kids might eat. Except that I never learned that pesky metric system. What's 500 ml of water? I'm sure there's a way to Google it and find out (what did we do before Google, anyway?) but my Google is upstairs and my kitchen is downstairs, and you know, that's just too much effort for the Bad Home Cook to expend. I apparently have all the necessary ingredients to make French onion soup as well. But a quick read of the recipe on offer suggests maybe I don't want to attempt this particular French onion soup. Besides being ignorant of all the pertinent metric measurements, it says I should use a stock cube (red flag!!) and throw in a cup of wine. What kind of wine? Doesn't say. Hmmm. Maybe I should just try it and see what happens. Could be a giggle. I still have no idea what to make the nits tonight. Maybe I'll just take them for fast food. I can have a glass of wine and call that dinner. Grapes, yes? I always loved the idea of the liquid meal. 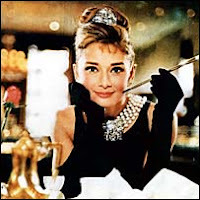 Holly Golightly did it in front of Tiffany's. Why can't I carry on the tradition?